I'm sure Heather will agree with me when I say we've had a non-stop, never-ending list of things to do for the paper since about Aug. 1. Maybe it was even earlier than that? I think I've been completely caught up with all my work maybe twice from that date until today. And today marks the third! Anymore it's a rare feeling of having everything checked of my list, both the Roundup list and my personal life list. And it's the Roundup list that's caught up right now. Right now I'm waiting to do the final proof of our Jan. 1 paper, which will be all done and sent to press so nobody has to worry about it in the week between Christmas and New Year's. In the photo above is Ryan Fieldgrove, second from right, with his three kids on their ranch. I interviewed him for our Winter Cattlemen's Edition, but it wasn't nearly so green and sunny when I was there in December! Last night I got my gifts wrapped and all of Scott's and my shirts ironed. Much remains in to prepare for the trip to Iowa, which will begin early tomorrow morning, but those were the two time consuming things. I just got back to the office from the house, where I cleaned out the fridge and cleared all my boxes and wrapping supplies from the spare room, where Melissa will stay tonight. She's on her way from Lander now, and I expect her in town within 30 minutes. I also put the smaller gift packages into a big rubber tub, and started collecting things on the dining table that I need to remember to bring. I hardly dare to say it, but I think at this moment I might be done with my Roundup work and free to go on vacation. It's this moment that's been the final goal at the end of the long string of typing, interviews, photos, folders, typos, edits, proofs, headlines, captions, meetings, reports, quotes, corrections....... and all the other things that combine to make up one complicated, detail-oriented, painstaking position as managing editor at a weekly livestock newspaper. I wrote one of the columns for these late December papers, and here it is. Perspectives from a meeting and convention attendee. 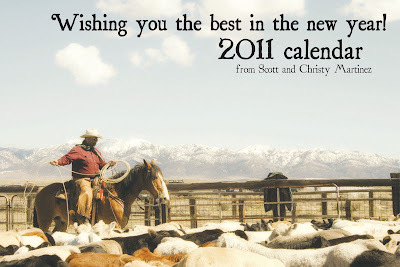 We here at the Roundup make an effort to get to all the conventions and meetings that our calendars allow, and with the Christmas holiday, the 2010 convention season has come to its end. In my reflections on the many people who have stood up and spoke to their subjects this fall, it seems that more of them have waxed philosophical then usual. Perhaps that’s because of concern surrounding the outcome of the estate tax in Congress’s lame duck session, and therefore the very future of many Wyoming ag operations, or maybe it’s because people are tired of work without progress. A frequent comment among convention attendees is that they keep discussing some of the same issues as they go round and round, year after year, with seemingly no real progress ever made. What is it that neutralizes all the good work of ag producers and ag families across the country who diligently produce safe and efficient food for the rest of the nation? That may be what has spurred the philosophical discussions. 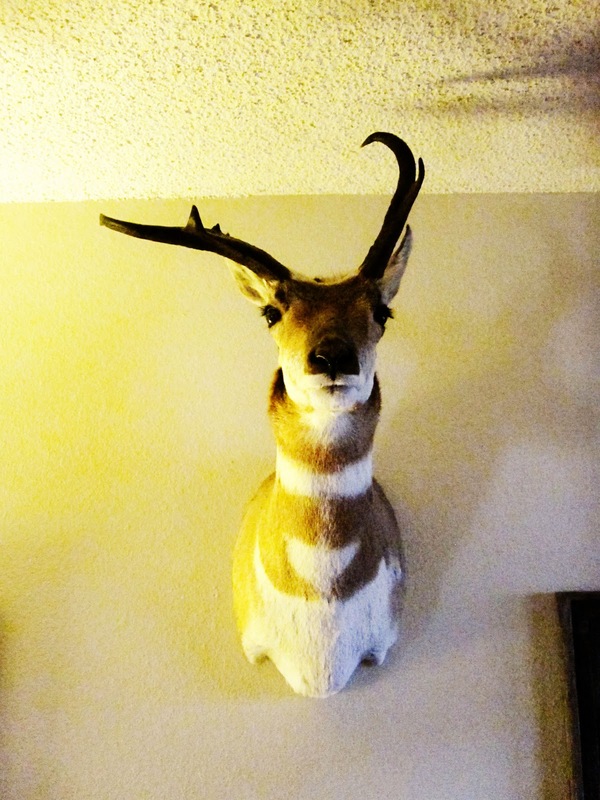 More frequently we hear people talk about “truth” and whether or not animals have equal status with humans, as well as moral ethics and how they impact the rural areas of America. As an FFA student said this fall after participating in an ag issues team at the national level, it’s important to understand the flip side of an argument before one can ever hope to change another’s mind. It seems that the very root of the opposition against modern agriculture is a belief system described as relativism, or postmodernism – put simply, that you have “your truth” and I have “my truth,” which ultimately comes down to the contradictory statement that there are absolutely no absolutes. These days the U.S. ag industry can’t even begin to insist that its livestock management practices are humane, much less market more beef to American consumers, because the truth is no longer the end-all, and because, in most of society today, feelings trump the truth. It’s impossible to skip to the end – selling more beef – when the beginning – the consumers’ beliefs – isn’t right. We can work as hard as we want at the best research and the most sound science, but it won’t make much of a difference to the people who have already made up their minds that they don’t like anything related to “unethical” or “inhumane” production agriculture in the 21st century. Never mind that in the 1950s we’d have needed the land mass equivalent to six more Western states to produce the same amount of beef as today. It’s because Brazil still produces with 1950s-era technology that they’re still clearing rainforests. It’s true that we all have that circle of influence that extends outside the borders of the ag industry – a sister-in-law who’s a nurse, a cousin who doesn’t believe beef is the safest or most nutritious thing to feed her kids, or simply a Facebook page or a blog. It’s up to us to educate ourselves on our own product so we can have productive discussions with those people, and it’s up to us to know why we choose our management practices for our livestock, and why we know it’s the right thing to do. Over the holidays, many of us will get together with those family members only seen occasionally, and I hope that we get the chance to explain our point of view on the morality of producing livestock on a large scale. We here at the Roundup hope all of you, our readers, have the merriest of Christmases. 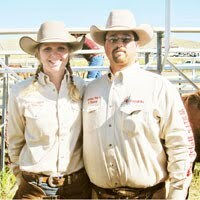 • Wyoming Stock Growers convention finished as a success. Lots of good things to write about for the paper, including many updates on upcoming legislative issues. General Session starts Jan. 11! • Roundup Christmas party at the office, and accompanying evening out at the Beacon. It's been a while since I've been out late, and it was fun to hang out with Heather, Tracy and Alvy. • Scott's mother's birthday party at Poor Boy's Steakhouse. Martinez family and company, and the customary insanity. • The last of Christmas gift shopping. • Knocking on my old apartment door to try to reclaim a Christmas gift I mistakenly sent there. No answer, and I might be out of luck. Who keeps a package that's not theirs? Low-lifes, that's who. That's why I left the apartments. Melissa can blame them for being short a Christmas gift. • Trip to Big Lots to get Foxy a supply of rawhide to last through her and Lucy's Christmas week spent at Grandma Martinez's house. She's a chain chewer. One after the other. • Several trips to the post office. • Dec. 25 paper just about finished up, and Jan. 1 paper in the works. They should both be all proofed and wrapped up by Wednesday evening. • Watching the weather and road conditions. Both look a little iffy for Thursday, our driving-to-Iowa day. • Laundry. Which, these days, consists of hanging everything to dry. The new dryer won't be delivered until Jan. 3. 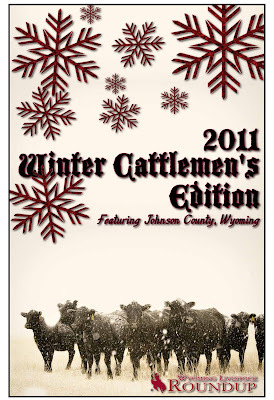 • Reviewing the final printed edition of Winter Cattlemen's, and very pleased with the final product. • Dropping off Scott's and my jeans to be starched so we'll be presentable during our trip to Iowa. • Getting started on wrapping Christmas gifts. • Printing 350 pictures and putting them in two photo books to have available for people to look through at our Iowa wedding reception Jan. 1. It's easier to show people than try to explain. Once book encompasses Scott's and my first year spent together, and all the adventures we had, and the second covers late summer, the Pendleton trip and fall work so far. • Taking numerous orders for pork we're bringing back from Iowa. So far we're up to four-and-a-half pigs, and perhaps that will be an even five by the time it's over. • Stopping by Odds and Ends last weekend, and deciding it's no longer my favorite store. I don't like the new owner. He's aloof, and has raised prices. What's the point of a thrift store if people think twice about spending money? The whole point is that things are supposed to be so cheap people can't resist taking them home. • Trying to keep a running mental list of everything I still need to do before we leave. Two evenings and one morning left to get it all done! In the midst of finishing up this week's paper this morning - got it just about licked - but I wanted to pause a few seconds to share these photos of the lovely snowfall we got yesterday. Our eight inches of snow fell just about all day long. Yesterday it was very warm, so a wet snow, but not so this morning. It was below zero when we woke up this morning, and everything is icy and frozen solid today. So that means whatever surfaces I didn't get cleaned off yesterday are impossible today. Like my car. I didn't even try to get the snow off and warm it up. Much easier to hop in the truck again. Let me just point out the cozy curls of smoke that are coming from our stovepipe. A great morning for a fire! I filled the stove full before I left for work this morning, and it will still be nice and warm in there tonight, especially if I add some more pieces when I'm on break this afternoon. Yesterday I finished a few more pieces of Christmas shopping, and picked up one for Scott, and got his mother's birthday gift, so progress is being made. Today Hobby Lobby is on the list of places to stop, as well as the post office for a few boxes that need to head to Iowa and Missouri. Here's hoping the sunshine melts some ice today! 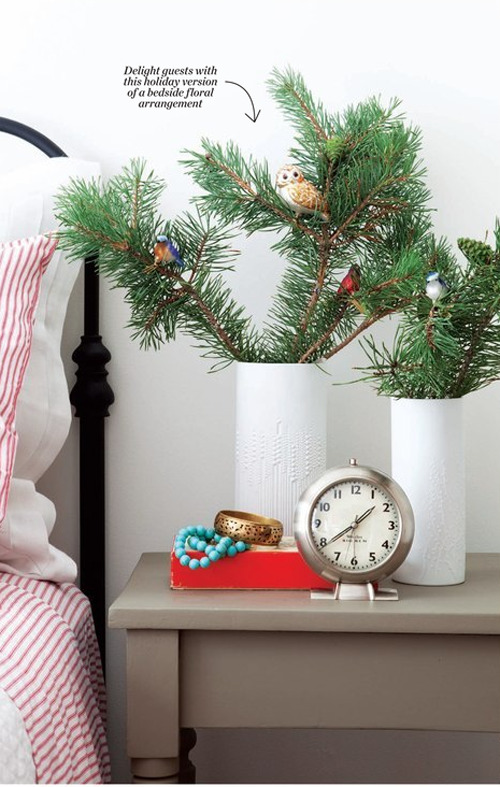 The crazy Christmas countdown is in full swing. 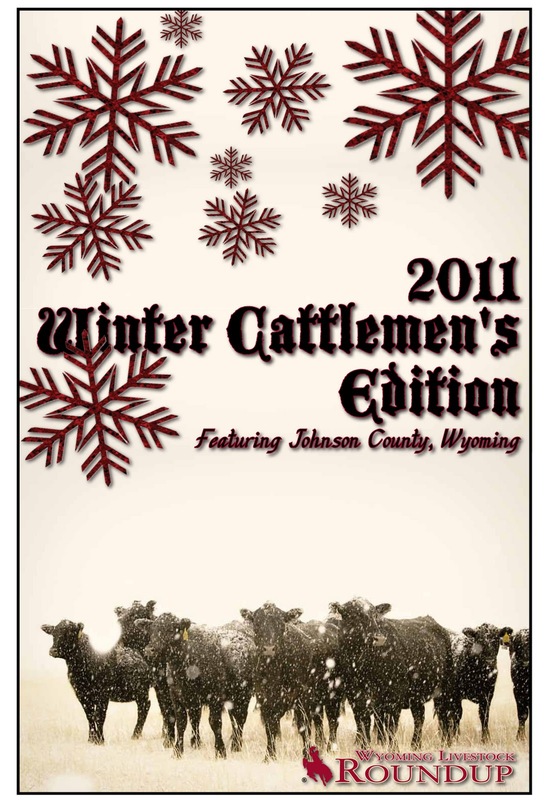 The deadline for Winter Cattlemen's was last Friday, and just this morning I sent Tracy the last article she needed to fill out the edition. As much work as it always is, I just got the proof from her, and it looks great. The cover's good, the inside flows nicely and I like it. I hope the people of Johnson County enjoy it as well. Doesn't it look so great and Christmasy and wintry? Right now I'm sitting at the Parkway Plaza hotel and convention center here in Casper, because the Wyoming Stock Growers Association winter convention is in full swing. Yesterday was mainly filled with committee meetings, and thankfully today's presentations are a little more interesting. Working on two articles for this week's cover on a keynote address from yesterday - that one's done - and the Wyoming governor-elect's address, which he just gave during lunch. Tonight Scott and I will return to the Parkway to attend the evening banquet. I'm looking forward to having him meet a lot of the people I work with on a daily basis. My attention has already turned to the three regular weekly editions that must be done by next Wednesday. Starting with this week's of course, which is on regular timeline, and then what we call the "Christmas paper" and the "New Years paper" due next Monday and Tuesday. Ideally, they will both be put together and proofed before we head for Iowa on Thursday. We do those two papers all in a rush so that the entire Roundup staff can take off the week between Christmas and New Year's. It's a great arrangement, and a reward that's worth the stress to get there. 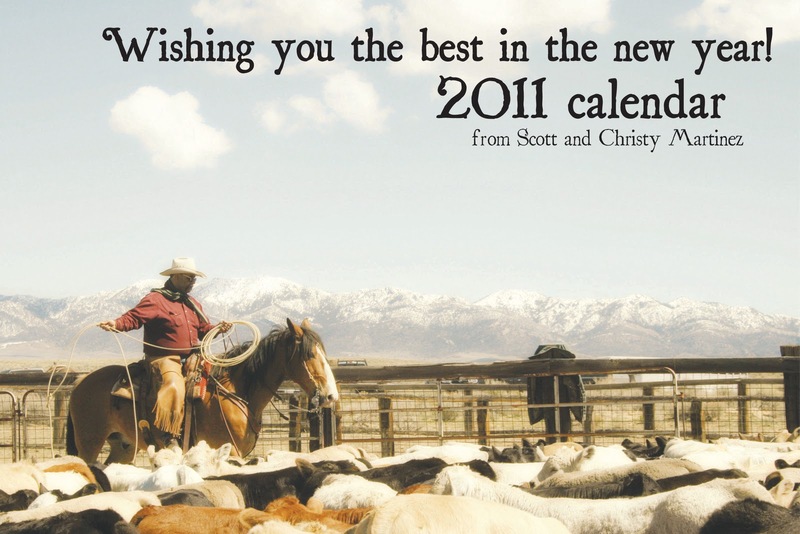 This Friday is the Roundup Christmas party, and Saturday evening is Scott's mom's birthday party at Poor Boy's Steakhouse. It all started with two big red buckets of leftover small evergreen branches from my porch railing project. I've had them saved in the shed for the last week and a half, and this morning I brought one inside to get to work on a simple Christmas decorating project I've had in mind for a while. I have this great big glass cylinder that my mom gave me for Christmas last year, and I knew I wanted to use it somehow with the evergreens. I wanted a pretty stout candle to go inside it, as opposed to the really tall taper that came with it, so I chose another glass piece out of my collection that would work as a stand when used upside-down. I went down and got into my candle box for the red pillar candle, and the whole deal was off to a good start. With my pruning shears I used for flowers all summer, I started clipping apart some of the bigger branches of evergreen and layering them in the cylinder around the upside-down glass piece. 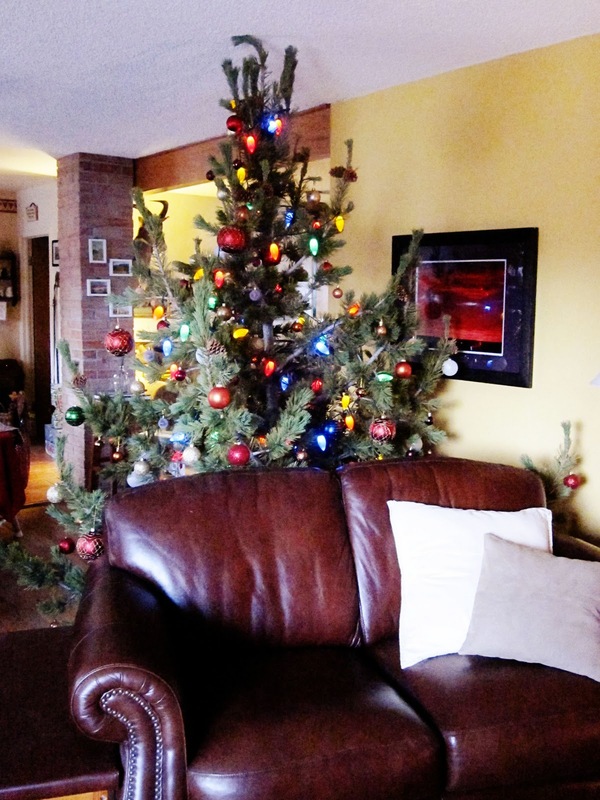 These are some of the Christmas balls I had left over after getting the tree trimmed. The discount store Ross is a great place to get cheap and large amounts of Christmas decorations, and that's where the mini red balls came from. The silver ones came with the cylinder, and the glass ones in the box my mom also gave me. I ended up not using them for this project, because they were too big to fit. And tada! This is what I ended up with after just a few minutes of clipping, arranging and dropping in the ornaments here and there. Link felt the need to take some credit for the new dining room table centerpiece. I saw this idea on an online blog, I apologize I lost track of the source, and I still have plenty of little evergreen branches left over in the red tubs, so I'm thinking I'll try to find them and make some little pine arrangements and decorate them with the glitter birds and some more small Christmas balls that I still have left. The few months before Christmas are some of my favorites, because I begin the brainstorm and search for gifts for the people in my life. I've got it just about finished up at this point, with a few things I need to pick up in town, and a few things still on the way through the postal system. And one thing that should have been here long ago... checking into that one. 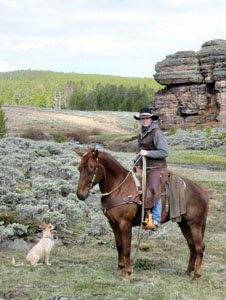 I went through my files and chose some of my favorite Wyoming ranch photos, most taken in the last year. Curiously enough, most of my favorites involve snowy scenes. Who would have thought? I'm excited to share the calendars! I ordered them from Vistaprint, the same place from which I ordered our wedding invitations, so I'm fairly confident the quality will be good. Excited to share the rest of my gifts with people come Christmastime! Just an update on the mares.... Jazz is definitely bred at this point, and I'm 90 percent sure that April is. She's a month and a half behind Jazz, so she isn't showing near as much as Jazz. You can definitely see Jazz's growing belly in the photo above, taken out at Trav's over the weekend. Jazz should foal in late March, while I don't expect April until mid- to late-May. Still hoping for at least one horse colt, and two would be ideal! I need some geldings to ride, as they're easier to take places, and we frequently help the neighbors and haul around the country. 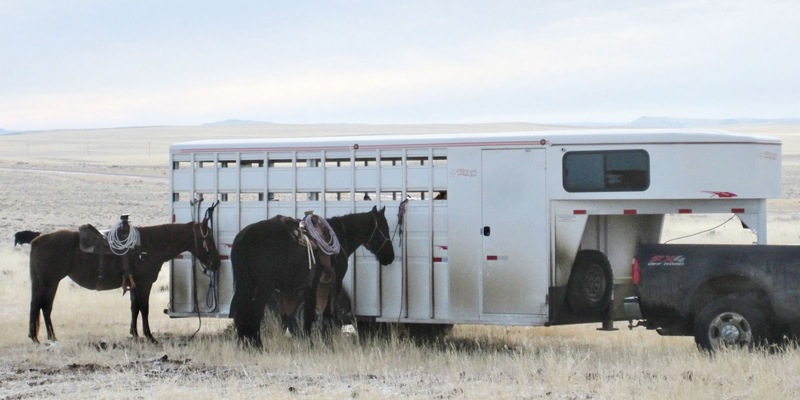 Most ranchers prefer all geldings, as strange mares tend to cause conflict amongst the geldings if they're housed in the same corral or pasture. 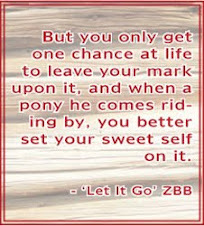 So, with my mares, we always have to make arrangements and keep them separate when I take them places. .... to even hope to make them all. 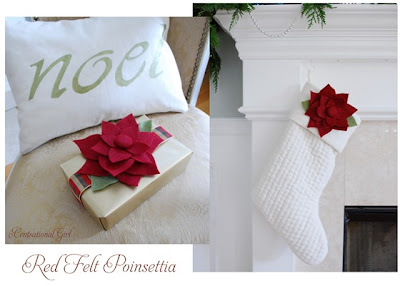 The latest find is Centsational Girl's felt poinsettias. So there I was, at the Casper YMCA at 6:15 last night, waiting for the Zumba class to start. I was relieved to find out I wasn't the only beginner, and also relieved to find out that everyone doing the class didn't already look like these two girls in the photo at right. Our instructor is probably about my age, and she was very friendly and engaging, and she showed me some of the simple steps the routine is based on. That doesn't mean it helped much! The women in the class are a great variety of young and old, and from all social circles, it appears. I didn't want to join a class full of wealthy skinny women in designer exercise clothes. When the class got about ready to start, all the other women lined up along the back of the gym and I, for sure, didn't want to be the only one standing in front of them. But, then they gradually moved up a little, and I assumed a space in the middle. I was pleased to find out that I actually did start feeling tired. At first I was thinking it wouldn't be intense enough exercise, but the longer one does it, the more you feel it. 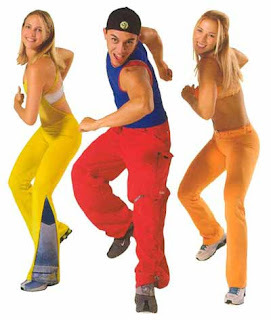 And I'm sure it will be a harder workout once I stop wandering through the steps and actually catch on and can anticipate the moves. I'm telling you, it wasn't very pretty at times. The Y has Zumba classes every night of the week. Monday, Wednesday, Friday are the regular routines, and Tuesday and Thursday are the toning routines, where light hand weights are also used. The instructor said the weights are two pounds, and I'm thinking that's not very much. I wonder, once I get the hang of it, if I could bring my own weights a little heavier. One thing - I do hope I catch on and make it harder, because I'm not sore at all, and I should be. 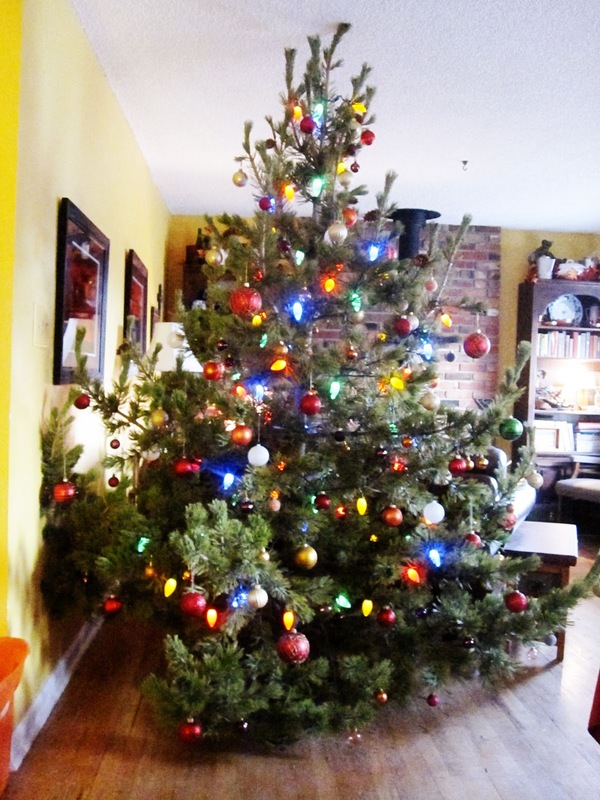 So there it is, my Christmas tree with ornaments! I can't decide if the colors of the Christmas balls clash with the colored Christmas lights I have this year. What do you think? Side view. I like strange and bright color combinations, so I think it's gradually growing on me. Especially at certain times of day. Some light makes it look better than others. I used to have gobs of Christmas balls, but this year just about all of the bigger ones went on the tree, and I think it's well-covered. And the back side, which faces the wood stove. 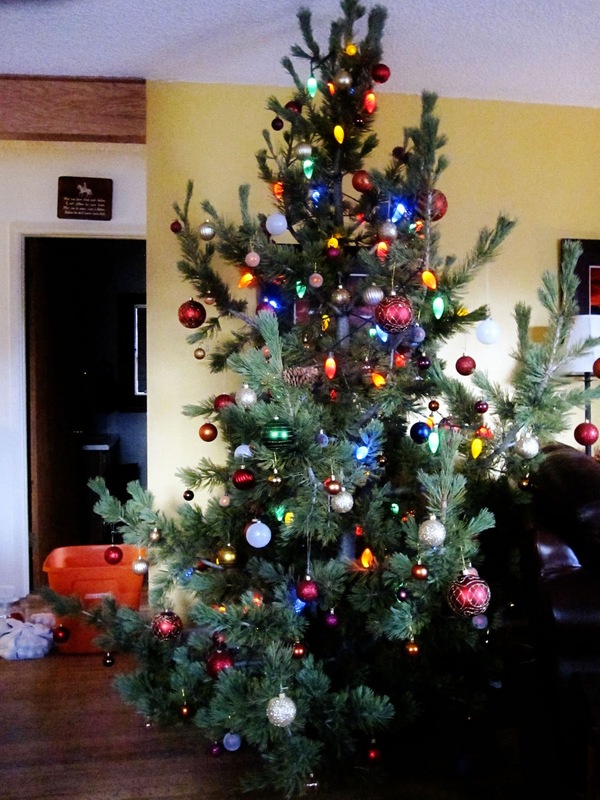 So far the girls have been good about leaving it alone, except the one branch that sticks out on the bottom they keep knocking into with their roughhousing, and occasionally the ornaments fall off. 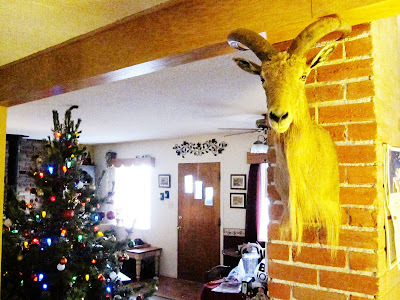 Scott refuses to let me hang an ornament from his crooked-horn antelope. The antelope itself looks a little to serious and stern to be messed with. Otherwise, I haven't decorated much else inside apart from the tree. Today I got that membership to the Y, and went to my first Zumba class tonight. It's basically Latin dance moves for an hour, and it was a good workout and got me sweating. Maybe coordination will come with time!